had asked about it some months prior. milestone in Philippine railway hobby history. 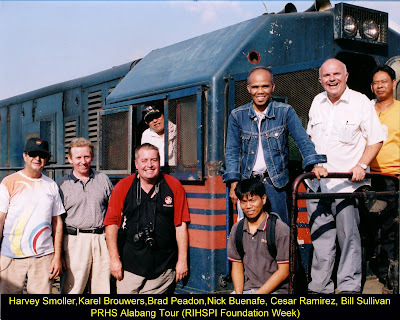 A request was made on the PRHS (then Philippine Railways SIG) Forum for people who would like to meet up at Tayuman for a day of watching trains, travelling on same and just to get to know each other. A week later, a visit to the PNR workshop at Caloocan courtesy of Edward Manapol (one of PNRs nicest people - sadly since gone) saw the decision made that something must be done to preserve this importantly. restored as a static exhibit at Tutuban station. While, for now, I am unable to be involved in what we started, one day it is hoped that attitudes change enough, the hobby put first, and I shall again be able to make a contribution to that which a handful of railfans and myself started just over four years ago. Heres to Philippine railway preservation.